Fish & Richardson’s Regulatory Group helps medical device manufacturers, developers, and wireless medical technology companies navigate the still-evolving regulations of both the Federal Communications Commission (FCC) and the Food and Drug Administration (FDA). We also work closely with our intellectual property attorneys to offer counsel on the protection and enforcement of technology in this rapidly developing industry. We are witnessing explosive growth in wireless medical technologies, including devices that control bodily functions and measure an array of physiological parameters. Even software, such as a smartphone application, can be considered a medical device depending on its function. Other types of wireless medical devices can communicate in some manner with landline networks, cellular systems, or broadband facilities that access the Internet. Without the proper authorizations from the FCC (regulates the use of spectrum) and the FDA (regulates medical devices), a medical device cannot be lawfully marketed in the United States. Fish helps clients in both of these areas, in addition to responding to agency investigations and other enforcement actions. We are also able to assist in civil litigation and shareholder lawsuits as well as intellectual property litigation in federal district courts. September 6, 2017: FDA issued a final guidance document entitled “Design Considerations and Pre-market Submission Recommendations for Interoperable Medical Devices” for medical devices that have the ability to exchange and use information through an electronic interface with another medical or non-medical product, system, or device. The guidance is intended to promote the development and availability of these devices by (1) assisting industry identify specific considerations related to the ability of electronic medical devices to safely and effectively exchange information and use exchanged information, (2) highlighting considerations for the design and development of interoperable medical devices; and (3) providing recommendations for the content of premarket submissions and labeling for such medical devices. August 1, 2017: FDA announced a software “pre-certification” pilot program, in recognition that its traditional approach to moderate and higher-risk hardware-based medical devices is not well suited for software. 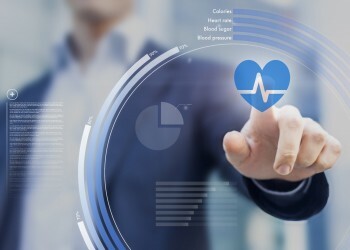 The Software Precert Pilot Program is a voluntary program that the FDA hopes will result in the development of a new approach by looking first primarily at the software developer and/or digital health technology developer, rather than at the product. July 29, 2016: FDA released a final guidance on “General Wellness: Policy for Low Risk Devices,” approximately 18 months after first proposing a novel rationale for not regulating what might otherwise be considered medical devices. July 11, 2016: FDA issued a final guidance on electro-magnetic compatibility for medical devices. The draft guidance references IEC 60601-1-2 and lists several items that should be included in an FDA marketing authorization application. February 6, 2015: FDA posted a final guidance on medical device data systems (MDDS) and updated the Mobile Medical Apps guidance to be consistent with the MDDS final guidance. A webinar was hosted on February 24, 2015 to discuss these guidance documents and the recent draft guidance on low risk products for general wellness. To watch the webinar or get a copy of the slides, click here. January 16, 2015: FDA issued a draft guidance on General Wellness: Policy for Low Risk Devices that proposes a novel rationale for not regulating what might otherwise be considered medical devices. For more information, click here. December 4, 2014: Fish’s Keith Barritt (DC) presented at the BIOMEDevice San Jose Wireless Medical Devices Track (Overcoming Wireless Infrastructure Challenges). June 20, 2014: FDA issued a draft guidance essentially deregulating Medical Device Data Systems, Medical Image Storage Devices, and Medical Image Communications Devices. As stated by the FDA, due to the low risk these devices pose to patients and their importance in advancing digital health it does not intend to enforce compliance with the regulatory controls that otherwise would apply, including the Quality System Regulation, establishment registration, and device listing. The draft guidance also proposes conforming edits to the FDA’s 2013 “Mobile Medical Applications” guidance. June 10, 2014: Fish & Richardson’s Terry Mahn and Keith Barritt presented “Regulatory mobile medical devices: Overcoming local and global challenges” at MD&M East in New York, NY. April 3, 2014: FDA, FCC, and the Office of the National Coordinator for Health IT issued a joint Health IT Report. March 27, 2014: Fish & Richardson sponsored the BIOMEDevice Learning Labs in Boston, MA. Keith Barritt presented “Regulatory Guidance on mHealth and Wireless Medical Devices.” For more information, click here. December 3, 2013: Fish & Richardson hosts expert panel at Wireless Medical Devices WEST during the BioMEDevice Conference in San Jose, CA. Speakers include Lisa Greenwald-Swire (Silicon Valley), William Hunter (Southern California), and Terry Mahn (DC). For more information, click here. November 6, 2013: Fish & Richardson hosts panel discussion on “Successfully Positioning Medical Devices for Protection and Approval” at Wireless Medical Devices EAST in Boston, MA. Speakers include William Hunter (Southern California) and Terry Mahn (DC). For more information, click here. 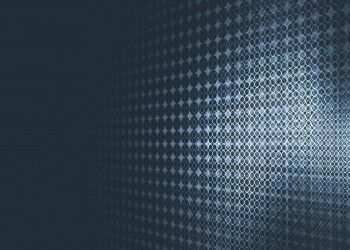 September 25, 2013: Mobile Medical Apps: FDA Issues Final Guidance. The FDA released final guidance on mobile medical apps. It plans to apply its enforcement discretion and regulate only those mobile medical apps that are considered “medical devices” and functionality could pose a risk to patient safety if they do not function as intended. 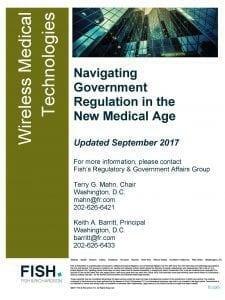 August 14, 2013: Food and Drug Administration releases guidance document on “Radio Frequency Wireless Technology in Medical Devices.” The FDA also announced a new “Wireless Medical Devices” web page to promote the safety and effectiveness of radio frequency wireless technology used in medical devices. May 24, 2012: FCC released a First Report and Order and Further Notice of Proposed Rulemaking to allocate 40 MHz of spectrum between 2360-2400 MHz on a secondary basis for a new Medical Body Area Network (MBAN) service. New spectrum rules will allow healthcare professionals to interact with patients through wireless body sensors to monitor, diagnose and control patient therapies remotely without the use of restricting cables, and to aggregate data from the sensors for backhaul to monitoring stations. MBANs will consist of multiple body-worn sensors and a transmitter/hub (i.e., a type of “base station”) that controls sensor communications. View our summary of the new MBAN service View the FCC MBAN Proceeding (E.T. Docket 08-59). July 26-27, 2010: The Federal Communications Commission and Food and Drug Administration held a joint public hearing on wireless medical devices in Washington, D.C. The purpose of the hearing was to gather information on the developing market for wireless medical devices and explore how the two agencies might cooperate in the future to help streamline the marketing authorization process. Specific topics of discussion included: (1) data integrity and reliability issues; (2) device and system security issues; (3) trends in medical devices using allocated spectrum and spectrum that does not require an FCC license; (4) risk management; and (5) current FDA and FCC regulatory requirements. At the public hearing, the FCC and FDA released a joint Memorandum of Understanding in which both agencies agreed to work together to promote initiatives related to the review and use of FDA-regulated medical devices that utilize radiofrequency emissions. The MOU is intended to promote collaboration and ultimately improve the efficiency of the regulatory processes for such devices. The goals of the MOU are to explore ways to: (1) enhance information sharing to ensure the safety and efficacy of medical devices; (2) improve the efficiency of both agencies’ regulatory schemes; (3) promote efficient utilization of “tools” and expertise for product analysis, validation, and risk identification; and (4) build “infrastructure and processes” that meet the agencies’ common needs. Fish's Keith Barritt Quoted in Bloomberg BNA's Medical Devices Law & Industry Report "FDA Performance, Medicare Coverage, Pressure From Excise Tax on 2014 Agenda"